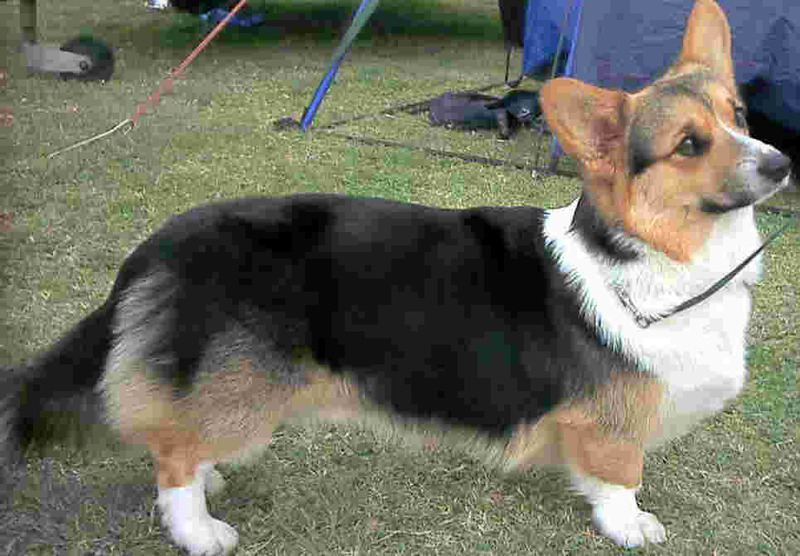 The Pembroke corgi takes its name from the county of Pembrokeshire in Wales, UK. Corgis were used on farms to herd cattle. Pembroke corgis are slightly smaller than the Cardigan corgi. Pembrokes have been made famous by the British Royal family, who keep corgis. Read the origins of dog breeds. 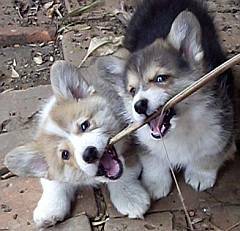 Corgis can be called "Welsh" corgis. "Welsh" means "from Wales." 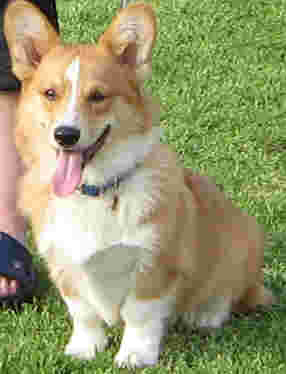 Pembroke corgis have short legs, long bodies, and a fox-like head. They are tough, medium sized dogs. The coat benefits from regular brushing. It sheds twice a year. A corgi is a trainable dog who makes a good pet and a good watchdog. It has been common practice to cut off the tail, leaving just a stump. This is called, "docking." Moves are afoot to outlaw the practice. If you are buying a puppy, you can ask the breeder not to cut the puppy's tail off. Buscorelli of Rivermagic, aka Busker, belongs to A, Holder, South Africa.Busker is tricoloured. Photos taken at Grahamstown KUSA Dog Show. Colour: Red with white markings is common, but they can be black & tan, tricolour, or fawn, with or without white markings. Height 25 - 30 cms at shoulder.